Django, an urban diner offers a no frills American menu. 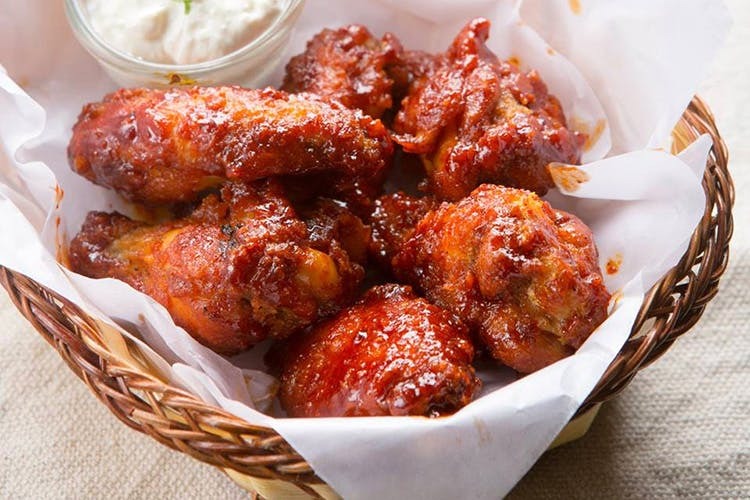 With a focus on serving freshly cooked food, burgers and fiery wings are what we're going for. Among all the noise and crowd of Indiranagar, we found a corner of peace in the name of Django. Serving up an all-American-style meal, go here for when you're not counting calories! The stars of the show are their chicken wings and burgers. We loved their barbecue wings (baby corn sticks for vegetarians) with sour cream, all made in-house. Their ham and cheese sandwiches come with peri-peri fries and hit all the right spots. While we didn’t try any of their meaty burgers, the tofu burger was quite the whopper and didn’t disappoint in terms of taste (or size!). We also tried their mushroom soup which was rich, hearty and a good option for rainy days. Speaking of rainy days, try their chef’s special deep fried Oreos and Kit-Kat to delight your inner child. End of the month problems? You can fill you tummy with some hot soupy Wai-Wai or Maggi and veg samosa or anything from their chai time menu for under a 100 bucks! Team that with some chai or filter kaapi and walk out guilt free with a full belly. Don't let our counting calories comment discourage you - they also have a curated Keto, and a vegan menu.